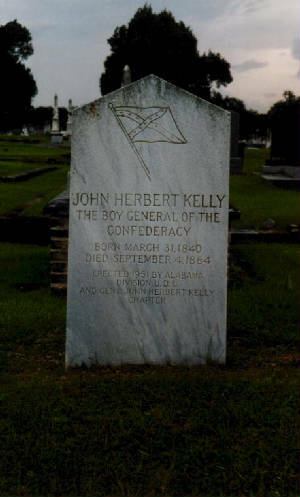 John Herbert Kelly, the youngest general officer in the Confederate Army at the time of his appointment, was born in Carrollton, Pickens County AL, March 31, 1840. 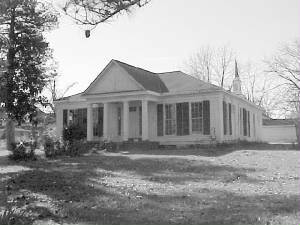 He was orphaned at the age of six and was brought up in the home of his maternal grandmother at Pineapple, Alabama. First on the staff of General Hardee with rank of captain, he was on September 23, 1861 a commissioned major of the 14th Arkansas. At Shiloh he commanded the 9th Arkansas Battalion, and for gallantry on the field was promoted colonel of the 8th Arkansas a month later. He commanded his regiment at Perryville and Murfreesboro, and led a brigade of Buckner's corps at Chickamauga, after which he was endorsed for appointment to the grade of brigadier general. Commissioned brigadier to rank from November 16, 1863, General Kelly was assigned a division of cavalry in Wheeler's corps and made a handsome reputation during the Atlanta campaign. In the course of Sherman's communications in the late summer of 1864, Kelly was mortally wounded in an engagement at Franklin, Tennessee, on September 2nd. Left in the care of the family of William H. Harrison, five miles south of the town, he died a few days later, probably on the fourth. 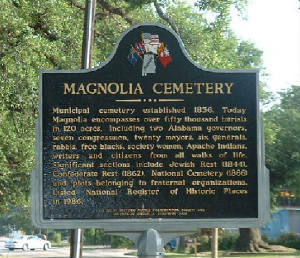 He was buried in the yard on the Harrison home; his remains were reinterred in Mobile in 1866.